KIEV, Ukraine -- More than two million Ukrainians took part in large-scale celebrations across the country Wednesday, marking the 67th anniversary of the Soviet victory over Nazi Germany in the World War II. 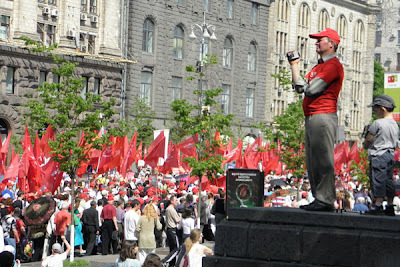 Communists march in Kiev on May 9, 2012. A solemn ceremony to commemorate the soldiers who sacrificed their lives in the war was held in the capital, attended by President Viktor Yanukovych, government and parliament officials, and veterans. They laid flowers at the Tomb of the Unknown Soldier and honored the memory of war victims with a minute of silence. Speaking at the ceremony in Independence Square, Yanukovych said: "We will do our best to avoid new wars and conflicts, to preserve the territorial integrity and sovereignty of Ukraine, democracy, internal civil peace and security." Wartime songs were performed at another ceremony in Kiev, where representatives of state and local authorities gave gifts to veterans. Similar celebrations were held in Kharkov, Donetsk, Lvov, Sevastopol, and in 4,700 cities and towns across the country. Each town celebrates the Victory Day in its own way. In Ukraine's northern and central regions, people eat traditional military porridge, while in southern and western regions different contests and the reconstruction of the war battles are held. Other features of the day include free taxis for war veterans and major fireworks displays in nine cities. May 9 has been a major national holiday in Ukraine every year since the end of World War II to pay tribute to the victims and the heroes of the war and to honor the surviving veterans.